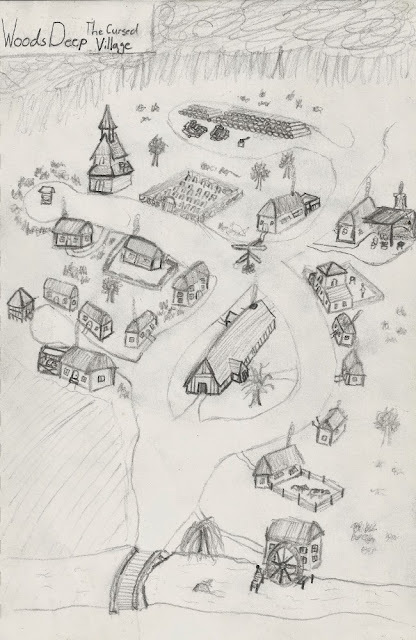 I drew this map back when I was 19. The Cursed Village of Woods Deep was designed to be a one-off medieval zombie invasion. There were simply too many Zombies, rendering it... Impossible. The first party I ever ran it for had an absolutely steallar night. Contasnt 20's were being rolled, while they devised brilliant and unorthodox methods of over coming the odds. That legendary game still holds the only party to have made it to the end of the Impossible Campaign, But JADE has given it a good try. Since its initial creation, the Impossible Campaign has evolved into a small 3-5 game adventure where players find out just what happened to Woods Deep. Woods Deep is a small village deep in the pine forests before the dark mountains. Lord Alex, the ruler of the fief containing Woods Deep, has not heard form the lumber town for 3 months. The captain of Lord Alex's guard and best friend Sir Roland went to investigate a fortnight ago and hasn't been heard from since. Just what happened in the peaceful little town?